Johann's mental state is tested, Shelly finds solace in her newfound friend. Roman and Annie grow closer. Peter's pack has a devastating development. Destiny gets a surprise. How many episodes of Hemlock Grove have you seen? Q: Who and/or what are the other creatures? 'Hemlock Grove' is a rare and strange beast among the many current fantasy/horror shows on TV. This new series is refreshingly original; although vampirism and werewolves haven't exactly been underrepresented in movies and TV-shows over the last couple of years, 'Hemlock Grove' manages to find a very interesting new approach and uses old European myths and legends - and even a bit of Sci-Fi - to inject some fresh blood into a genre that started to feel a bit stale. The mix is strangely compelling – and highly addictive. The cast is very strong, especially the two leads Bill Skarsgård and Landon Liboiron – and of course, the always great Famke Janssen. The production values are also worth mentioning: the music, the cinematography and the set-designs in this show are absolutely beautiful, the gory make-up effects look realistic and CGI is thankfully kept to a minimum. I'm a bit surprised this show hasn't found a bigger audience yet, given how well it is produced (and this wasn't exactly a cheap affair either: season 2 had a budget of 52 million dollars for 10 episodes), but maybe it's just a bit too original for that. 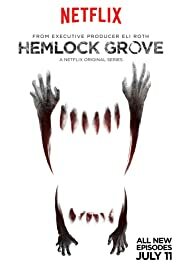 As far as I'm concerned, 'Hemlock Grove' certainly deserves to be seen; offering unique 'Horror' with a fantastic, slightly surreal atmosphere and amazing images, this highly original series is a prime candidate for binge-watching. 8 stars out of 10. 101 of 123 people found this review helpful. Was this review helpful to you?